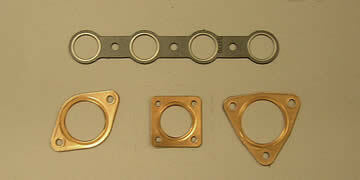 This gasket is made up of steel faces cleated to a soft core. It is frequently fitted to diesel engines with turbo chargers where high temperatures and exhaust flange movement is likely. Our downpipe gaskets are composed of copper facings either side of soft or composite fillers. In this way, we ensure durability as well as a top class seal. We have the expertise, the experience and the specialised tools to provide you with the quality product you need.